G'Day mates, last week, I held a contest to celebrate my readers outside of the US and Canada by honoring my largest audience beyond those regions. It is with great pleasure that I announce the winner of the contest: Australia! Lots of other countries battled hard but the Aussies prevailed. I will use some Australian slang this week, so if you fail to comprehend something, feel free to ask. Thank you to everyone who participated. Here is a little something for you from my dear friend and graphic designer Jordan Karkoulas. (@JordanKarkoulas) It's an Ace! Let us know if you like the poster. When you go 1-4 one week and get humbled like I did, you actually feel grateful for a 3-3 week. The results could have been better (Texans, Patriots 'Under') or worse, (Redskins not covering) so I will accept the outcome and work to improve them this week. Seems like donkey's years since I've had a big winning week so a reversal of fortune is due. Let's make some bikkies this week! Fact: The teams the NY Jets have beaten this season have a combined record of 31-46-1. The teams the Jets have lost to have a combined record of 50-27. The Jets have only lost to one sub 500 team this year, the Dolphins. Conclusion: the Jets have prayed against the weak and have been roughhoused by the powerful. Fortunately for the Jets, the Tennessee Titans are anything but powerful. With a 4-9 ATS record, they hardly instill fear on their opponent. Conversely, the Jets have played well on the road with a 4-2 ATS record away from MetLife. Titans have been inefficient on offense averaging 15.9 yards per point. When you rush for 44 yards in 19 carries against the porous Colts D, you know something is not right. The Titans have been hit by the injury bug on their O line and Chris Johnson has been erratic. Jake Locker has looked ordinary so far in his young career with a 9/9 TD/INT ratio and a QB rating of 76.2. Locker has a tough match up against the Jets pass D allowing 6.3 YPA and a 54.2 completion rate to opposing QBs, top five in the NFL respectively. The Jets secondary won’t allow Locker to get in a rhythm and will curtail Titans’ drives. Mark Sanchez has played uninspiring football this season and he is clearly not a franchise QB. If provided protection however, he will have mild success against the Titans secondary conceding 7.2 passing YPA. Sanchez has a whopping 19 giveaways so far this season, so the key for him will be to protect the ball and let his defense give him good field position. In terms of numbers, I don’t see a glaring advantage for either team. However, the trends are clearly in favor of the Jets; Jets are 6-0 ATS, 5-1 SU in their past 6 vs. the Titans. The Jets are 4-1 ATS in their past 5 road games. The Titans are 1-6 ATS past 7 December games. In this spot, I’ll take the desperate team making a final push for the playoffs over the miserable Titans. The Packers were able to weather the storm (pun intended) and gain steam in the second half of their previous game. They will continue to build on this momentum this week against the reeling Bears losing four of their past five games. The Packers were able to establish the running game last week combining to rush for 140 yards in 25 attempts. A stout running game lessens the load on Aaron Rodgers and makes the offense more varied. Additionally, the Bears have looked vulnerable against the run allowing a sloppy 5.2 rushing yards per attempt (YPA) over their past three games. The Bears are banged up on defense and they might be missing some key players for this game. Look for Rodgers to settle the running game early and go to the play action as the game wears on. Although Jay Cutler did not finish last week's game, he should be ready to go this week. Looking at Cutler's numbers closely, Cutler has bullied bad teams while struggling against good ones. (Seattle being the lone exception) Unfortunately for Cutler, the Packers are getting healthier on defense and looked good last game. Sam Shields made an immediate impact picking off a Stafford pass in the red zone. The Packers pass defense is conceding an impressive 6.1 passing YPA over their past three games. Moreover, Clay Mathews has a chance to get back on the field this week, only making life more difficult for Cutler. From WalterFootball, Jay Cutler is 29-49 ATS if you exclude Monday Night Football. Aaron Rodgers is 21-10 ATS on the road as long as he's not favored by 6.5 or more points. The Packers are 11-3 ATS at Soldier Field since 1999. Give me the surging team with a better QB and I'll take them straight to the bank! Houston has played its last three games on the road and will now be playing on short rest. Although they will look to move past last week's embarrassing MNF loss to the Patriots, look for the Texans to start off a little flat. With TE Garrett Graham missing the game due to a concussion, the Texans were not as successful running the ball nor were they able to protect their QB. Graham's status for this week is still uncertain but the Texans will get ample opportunity to run the ball against a penetrable Colts defense conceding 4.7 rushing YPA. According to TeamRankings, Indianapolis has had one of the lightest schedules in the NFL this year. Nevertheless, unlike many teams, the Colts have taken full advantage of their schedule and used the adversity they have faced to inspire them. Andrew Luck, a Houston native, is playing his first game in front of his hometown and will look to impress his friends and family. The last time the Texans faced a good scrambling QB, Jake Locker rushed for 38 yards. Andrew Luck, who is one of the smartest running QBs in the league, will be able to extend drives with his running ability and keep the Texans linebackers guessing. According to Joe Freda at SBR Forum, the Texans are 0-4 ATS in their last four Sunday games following a MNF affair. This selection is more of a gut play than numbers. With such a large spread, the Colts can cover back door (with a late score) or keep the game close throughout. 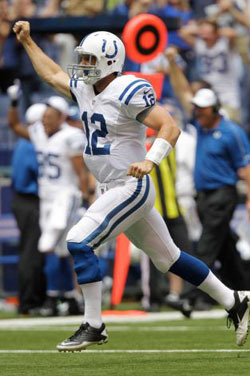 The Colts have Buckley's chance to win the game, but they will cover with the points. The key for St. Louis to win this game will be to contain the spectacular Adrian Peterson. I learned the hard way last week (betting against the Vikings) that it is easier said than done. Unlike the Bears, the Rams are relatively healthy on defense and get a ton of pressure on the QB, 2nd in the NFL with 39 sacks. For two straight weeks, the Rams have shut a very good ground game. The Rams surrendered just 53 yards on 23 carries against Frank Gore and 51 yards on 16 carries to C.J. Spiller and Fred Jackson combined. The Rams will load the box with 8 defenders and force Christian Ponder to beat them. My assessment of Ponder has not changed since last week. He shows poor judgement on the field and makes costly errors. Sam Bradford has shown flashes of talent, yet he has been highly inconsistent. With the emergence of Chris Givens, Bradford will finally have a potent one-two combo at WR when Danny Amendola returns from injury, possibly this week. However, Bradford does have a better QB rating (81.9) and passing YPA (6.7) than Christian Ponder. Here's a great stat I found on CHFF, teams that enter the game with a higher passer rating have a record of 108-54 in 2012, 35-9 since week 9. If you wonder which stats you should examine before handicapping, the passer rating is one of the better simple ones at predicting winners. The Rams have played good football under the tutelage of Jeff Fisher and they are about to turn the corner as a franchise. With a 9-4 ATS record and playing at home, I'll put my faith and money on the Rams to stop Adrian Peterson and prevail in this game. The Steelers will look to put on a show in Dallas after their embarrassing effort last week against the Chargers. Dallas is returning home on a high after their impressive come from behind win in Cincinnati. This is a recipe for disaster for the Cowboys who are 0-6 ATS at home this season. Although Ben Roethlerberger did not play a great game coming off his injury, he showed no ill effects rushing for 31 yards. Big Ben did not receive much help from his receivers when it mattered as there were too many drops in the early part of this game. Nevertheless, the Steelers offense will have a chance to be successful against a mediocre Cowboys D allowing 4.5 rushing YPA and 7.5 passing YPA, landing them both in the NFL's bottom 7 respectively. If Big Ben gets some protection, he will be able to torch this Dallas secondary. As tough as I am on Tony Romo, he has played very well of late, amassing a 11/3 TD/INT ratio and a QB rating of 105.6 over his past six games. Romo has also been sacked 18 times during that span so the Steelers will be able to put some pressure on Romo. Despite all their injuries on defense, the Steelers are 2nd in the NFL allowing a miniscule 5.4 passing YPA. This is a battle Tony Romo is not expected to win. The proceeding will only get more difficult if Dez Bryant (fractured index finger) misses the game. Demarco Murray has yet to discover his explosiveness returning from his injury three weeks ago. Since his return, Murray has rushed for 136 yards in 41 carries, averaging a measly 3.3 yards per carry. The Steelers also excel in stopping the run conceding 3.7 rushing YPA. Murray will be kept quiet on Sunday. From WalterFootball, Mike Tomlin is 11-6 ATS coming off a loss as a favorite. Coach Tomlin will motivate his troops and you will see a focused effort from the Steelers. Conversely, the Cowboys are coached by Jason Garrett who manages to lose games he should win. The Cowboys are 1-6 ATS in their past 7 December home games. My money is going on the team with a better track record in December and a knack to win clutch games. I look forward to your feedback and comments. Make sure to check out the comments section to see the interesting picks my friends and readers have posted here. My MNF pick will be added prior to the Sunday Night game. I will also add my additional plays and teasers in the comments section. Thanks very much for reading. Good luck with your bets mates! Hooroo. I like to keep my teasers small, 2-3 outcomes. I might post another one of these tomorrow. I like your explanations and analysis. I'm following ya on these plays buddy! What are your thoughts on the Oakland game? I don't really see a value in betting for either team. It'll come down to the Chiefs running game vs. the Raiders passing game. Both defenses are terrible. Home field advantage doesn't mean much to the Raiders; they are 1-6 ATS at home. Oakland is also 1-8 ATS in its last 9 games when playing at home against Kansas City. Even though McFadden will likely play tomorrow, I wonder how effective he will be. On the other hand, Brady Quinn is starting for the Chiefs. Enough said. The running game is more predictable than the passing game and Jamal Charles has been on fire of late while Palmer has been average, so if I had to bet this game, I'd go with the Chiefs. Who will record the most Passing Yards in the 1PM games? The Colts will be playing from behind for most of the game. Luck is 2nd in the NFL in pass attempts. Houston has defended the pass well for the most part this season, but have struggled of late by their standards, allowing 6.9 passing yards per attempt over their past three games. I'm liking the value there! Thank goodness! A win! A freaking win! Now it's time to take that momentum and keep rolling with it. Sure it was a 1-1-1 week, but at this point I'll take anything other than a goose egg. Let's keep it going and check out this week's “Podium Picks”! If you read last week's “Podium Picks” then you know how I feel about the Baltimore Ravens. If Kirk Cousins can beat your defense in the final minutes of the game and then school you in overtime, then what the hell is Peyton Manning going to do to you? Well Mr. Manning I predict will finally show these Ravens that they are not a top team in the AFC, and tear up this overrated defense (who won’t have Ray Lewis back this week). When you add the fact that the Broncos sport the fourth overall defense in the NFL you get a recipe for a big payday. Sure I realize the Ravens finally fired the inept Cam Cameron from the offensive helms, but that isn't going to make Joe Flacco an elite QB, he will continue to perform at a mediocre level. If the Ravens finally do decide to hand the ball off more to superstar Ray Rice then this game will not get badly out of hand, but I believe Manning will end up being too much to handle for this Ravens D. Put your money on Manning and you won't be disappointed. Better coach, better defense, and better quarterback, what is there not to like about this Steelers team matching up against an inferior Dallas squad? Also did I mention that Pittsburgh is fighting for their playoff lives and this game is an absolute must win? Sure Dallas has their back's against the ropes too, but we've seen how they have responded to these types of situations before, they crumble like stale bread. When you put Tony Romo up against the best defense in the league you get one thing, turnovers, and lots of them. The Cowboys will get their chance to win or tie this game towards the end, but due to Romo's shaky nature and Jason Garrett's inability to manage late game situations I see the Steelers holding on to a nice 3 point win and in the end making us some money. Don't look into last week's performance too much since Big Ben wasn't 100% percent healthy, he will show up for this game, believe me. Add the fact Romo’s top weapon Dez Bryant has a fractured index finger, you have a recipe for a Steelers win and cover. Hey, Deion Sanders believes in Eli and so should you. This Giants team is just impossible to predict sometimes, but when it comes to the end of the season and playoff time they just win baby. Coming off an impressive win over the Saints in which they FINALLY let David Wilson touch the ball, I believe the Giants have discovered a new weapon they will unleash more upon the Falcons. With Bradshaw ruled out for this game look for Wilson to step up and receive a lot more carries and shred this Falcons D. When you add the fact that the Giants defense is starting to get their mojo back and Hakeem Nicks is slowly getting healthier you start to see why this team has won 2 Superbowls, and will defeat the Falcons come Sunday. My feelings towards the Falcons are similar to that of the Ravens; this team isn't for real. They have a one-dimensional offense (they seriously can't run the ball) and their defense is average at stopping the pass. Look for the Giants to dare the Falcons to run the ball and focus on the pass rush and for Eli to have a good day connecting with Cruz and Nicks early and often. Give me the Superbowl champs fighting for their playoff lives over a team that has nothing to play for any day. That’s it for this week’s addition of the “Podium Picks”; good luck and see you all next week. Nice picks Sots. I'm liking the silver and gold picks but not sure about the bronze pick. Similar to the Packers situation, the majority of the bets have gone towards the Broncos yet the line remains unchanged. Seems fishy. Flacco also plays much better at home. Giants+1.5, Steelers-2.5, Patriots-4.5, and Seahawks+1.5 and Jets+7.5; 6 point teaser. Liking all those picks Kyle. I'm still undecided about the Pats/9ers, but the rest of them seem very solid to me.